DANIEL DUBOIS DOES not view the prospect of himself mixing with the elite of the heavyweight division as a long-term ambition. The 21-year-old London based powerhouse is planning to climb a good few rungs of the heavyweight ladder over the course of 2019 and put the big three – Messrs Fury, Wilder and Joshua – on notice that the emerging force is quickly playing catch-up. “This is the year for me and I am determined to make it a big one,” said the 9-0 man, who will take himself into double figures at the Royal Albert Hall when he meets Razvan Cajanu on March 8. “I’m gonna give 100 per cent and we will see by the end of the year where I am at. I am so determined to make this a positive year. “I think I am not that far behind the best out there,” he insisted. “With a few little adjustments and, not rushing anything and staying grounded and real about the situation I’m in, I believe my skill will move me even closer to the big names out there. “I am really not far behind now,” added the quietly-spoken but steely Dubois, who believes a productive run of fights against the right opponents will set him on a collision course with the current leaders of the heavyweight pack. 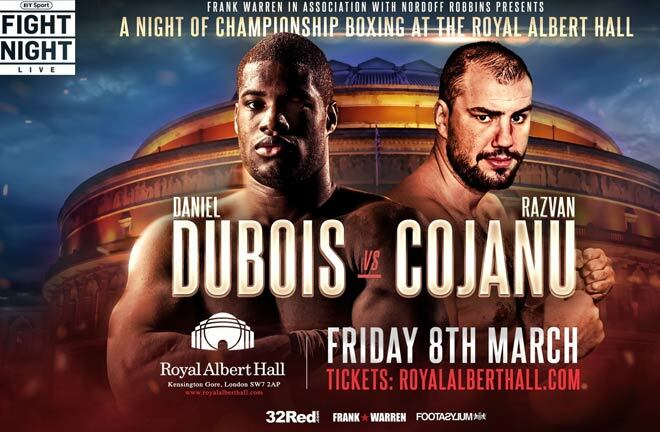 Dubois missed out on reaching 10-0 against the American-based Romanian Cojanu in December when he suffered a seasonal KO that ruled him out of delivering some festive punch for the second year running. “It seems to happen all the time around December,” he reflected with a heavy sigh. “Maybe I don’t adapt very well to the change of weather and the virus took me out. “It wasn’t just man flu, it was a proper virus and whatever it was it was dreadful. “It was disappointing to miss a fight but I think the rest might have served me well, giving me time to rest my hands. His first assignment of the year is take two of his aborted mission against Cojanu, who ultimately fought a week later against Dubois’ domestic rival Nathan Gorman, who cruised to a relatively comfortable points victory in Manchester. Dubois was not overly impressed with what he saw from either man. “Yeah I saw the highlights but didn’t watch it all,” reflected the Londoner. “If you are asking for my opinion on the fight, I thought Nathan and this guy didn’t produce a spectacular fight. “I expected it to go the distance because Nathan is not a knockout puncher, but he can box and this guy didn’t have much ambition to win. Dubois goes along with the theory that Cojanu is tailored more to his strengths than that of Gorman and a KO statement is on the cards. “That is definitely it and I’ve got to show that I can. I’ve got to go in there and do a job on him. I’ll take him out whenever I see the opportunity. I’ve got to create the situation, create the openings and I am looking forward to it. Also at the Royal Albert Hall, Nicola Adams OBE will look to make history and be the first female crowned World Champion at the venue as she challenges for the WBO World Flyweight Title against Arely Mucino on International Women’s Day. Liam Williams makes a first defence of his British middleweight title against Joe Mullender, while Johnny Garton will defend his British Welterweight title against Chris Jenkins. Lucien Reid will fight Indi Sangha in what will be his toughest test to date, with GB Flyweight Harvey Horn, cruiserweight talent James Branch and middleweight banger Denzel Bentley also featuring. Next articleGARTON: I WAS EVEN MORE OF A SLUGGER!